Yacht Charter Englewood FL - Hop on board our 45 foot yacht for your next special event The "Reel Keel” is located in Placida, Florida next door to Leverock's Restaurant at Aqua Marina. 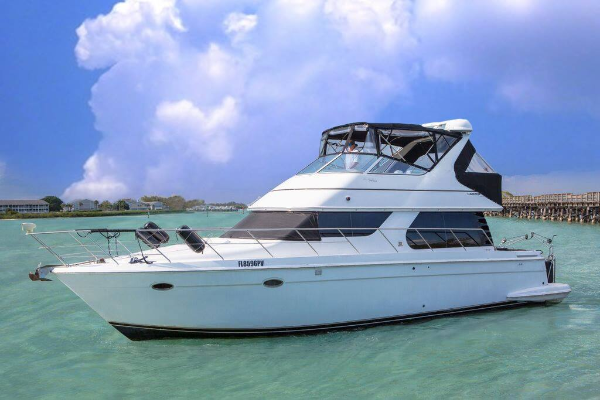 This vessel is a forty-five foot Carver Voyager Pilothouse with an exterior and interior roomy enough to sit back and enjoy your yacht charter in complete comfort. Come and experience a true all inclusive vacation at sea and explore our historic coastal towns as well as many uninhabited islands. We can provide round trip party bus limo transfers, several tour options and shore excursions included in one package price. So take a look at our yacht charter packages and compare! If you price free party bus transfers, accommodations, day trips and small boat tours out seperately, you can see why a private yacht charter is great value for your next vacation. If you have never experienced Florida "from the water" - then you have not seen all the magnificient beauty that can only be seen from that vantage point. Sitting on shore in Southwest Florida beaches is definitely beautiful but seeing the coast and beaches from the water is an experience everyone should indulge in! There are lots of fabulous things to do in Florida, but a yacht charter is something that will please everyone in your group. We have calm seas the majority of the time, great weather, and turquoise waters all around. On board our 45 foot Carver yacht, we have a giant float, phenomenal sound systems and free WiFI. You can have all the creature comforts of home and be out to sea at the same time. Our yacht charters provide limousine pick up in Fort Myers and Sarasota for a nominal fee but the party bus transfers are free if you live in Venice, North Port, Punta Gorda, Port Charlotte, Placida, Englewood, Cape Haze or Boca Grande, Florida. So, come and party without worrying one bit about driving after your boat tour. Plan your next holiday or special occasionwith Gulf Island Tours and let us treat you and your esteemed guests like royalty. 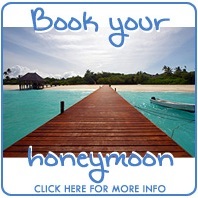 Perfect for anniversaries, birthday parties, honeymoons, family celebrations or any special occasion. Check out our yacht charter packages to find the right package and itinerary for your next special occasion! 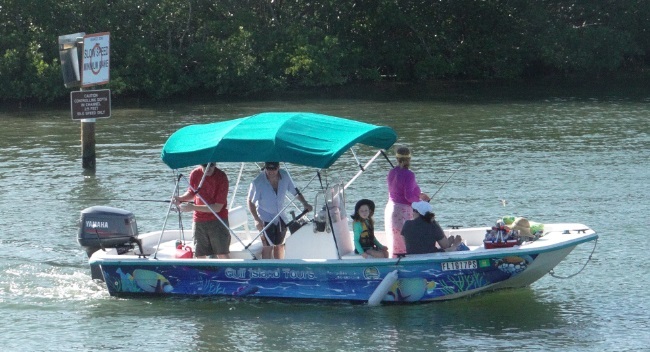 Pontoon Boat Tours Englewood FL - Host your next special event aboard the H20 Limo! Rent the boat right in Englewood at Chadwick's Cove Marina or have it delivered to Little Gasparilla Island, Palm Island or Boca Grande. Customize your own Gulf Island beach tours with our local guide services. Pets are welcome and we have bathroom facilities on board this very comfortable double decker pontoon party boat. You can enjoy a great sound system with Sirius Satellite radio, DVD players with flatscreen TV's plus an IPOD docking statio aboard this fun boat. Catering available for an extra charge or use our gas grills and small kitchen onboard for free. Combine the H2O Limo with our land limousine services for the ultimate experience in comfort, safety and for a worry free vacation! For experienced boaters, the H2O Limo can also be rented as a bare boat rental. If you are staying on Little Gasparilla Island and have a large family, this would be the ideal boat rental for the week. We can meet you at Eldred's Marina in Boca Grande so there is no need to ride the ferry or take a water taxi to Little Gasparilla Island. While there are plenty of ponton boat rentals around Englewood, Florida, we promise you your family will be delighted with this custom designed pontoon boat rental. If you are not familiar with the waters or with navigating a rental boat, we can arrange for a guide to take you out. Cabbage Key is a wonderful destination and has a restaurant in a gorgeous rustic setting people always enjoy. From there, you can venture down to Captiva Island to The Green Flash restaurant sure to delight even the most discerning of pallettes. Another wonderful destination on Captiva Island is Tween Waters Resort. There, you can indulge in all the resort's amenities such as the enormous pool, shuffleboard and bocce ball courts or you can venture across the street to enjoy one of the most spectacular beaches in all of Southwest Florida. There is definitely no shortage of fun things for the whole family to enjoy at Tween Waters resort. If the Gulf is too rough, our unique area has calm mangrove channels to explore on the "inside" in the Gulf Intracoastal Waterway (GIWW.) 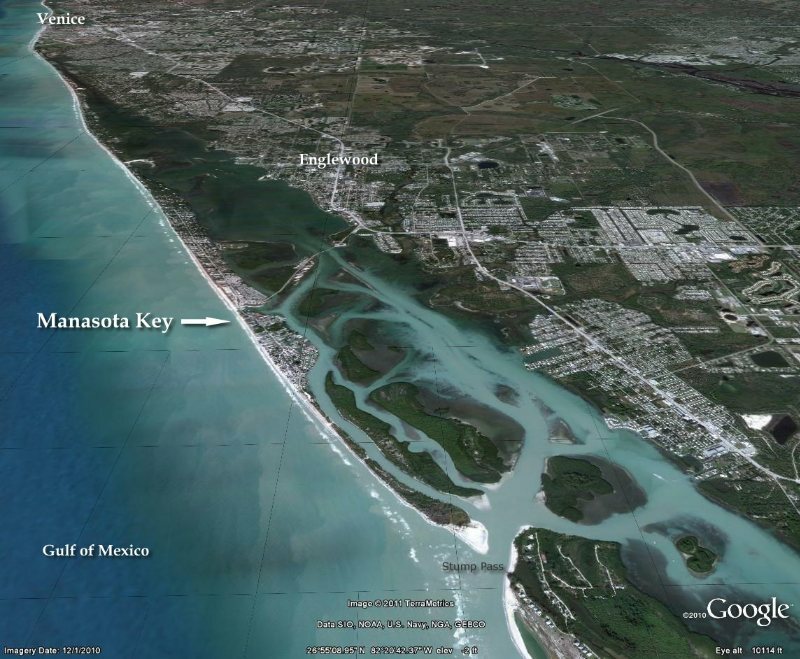 Along this channel, you can also venture north of Manasota Key to spend the day in Venice Florida at Marina Jacks. There you can explore the island by way of free bicycles offered for Marina Jack customers. Venice is a very unique are because the entrance from the Gulf of Mexico has two very long man made fishing piers made from enormous rocks. Within easy walking distance of the marina ithere is a wonderful public beach! So, whether you venture north on your boat tour or south on your rental boat, we have great itinerary options sure to delight everyone in your group. Book our pontoon boat rental or pontoon boat tour on your next Florida vacation. We definitely have the best pontoon boat rental in Englewood FL! Boat Rentals Englewood FL - We have three Carolina Skiffs for rent and our rates are very reasonable. 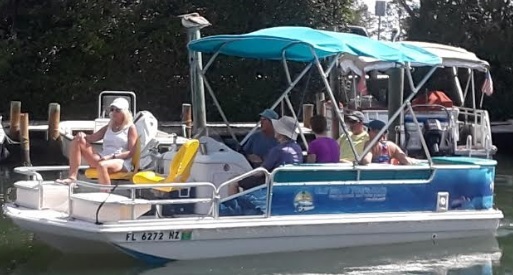 Select from either a 18, 19 or 20 foot Carolina Skiff for a half or full day of fun If you are looking for a larger boat rental, we also have several 22 foot deck boats that you can rent by the day or by the week .Our rental boats offer quick & easy access to the Gulf of Mexico . Be your own captain or we can arrange for a local guide aboard our boats if you are unfamiliar with the area or just want to relax on the beaches with your favorite adult beverage in hand .With advanced reservations, we can have your boat rental delivered to you within a 30 mile radius of Englewood, Punta Gorda, North Port, or Gasparilla Island Florida to any public boat ramp or private boat dock. Call for details ot to reserve your boat rental. Weekly rates are also available at private docks on Lemon Bay or the Gulf ICW. We know there are lots of boat rentals around Englewood to choose from so here are some things to consider before renting a boat. Our Carolia skiffs are designed specifically to run in shallow waters because they are flat on the bottom. Unlike V-hulls, our boat rentals don't have to be anchored away from shore. You can drive the bow right up on the beach and tilt the motors up. If you want to walk along the beaches and do some shelliing, these rental boats are ideal plus they are much easier to get in and out of than a center console boat rental. Our rental boats are also great on gas and will get you where you want to go quickly! All of our rental boats have GPS, all USCG Safety equipment and live bait tanks. Since skiff boats are designed to maneuver way up into the shallows, they are perfect for flats fishing enthusiasts. If the Gulf is very calm, we do allow experienced boaters to go out into the Gulf of Mexico to do some in shore fishing. Most boat rental companies will not allow their rental boats to be taken out of Lemon Bay. These are all things to keep in mind when looking for the right boat rental in Englewood, Florida. Our deck boats are rated for 10 people and have very comfortable seating. So, if you have been looking for a boat rental near Boca Grande or Englewood Florida, give us a call. 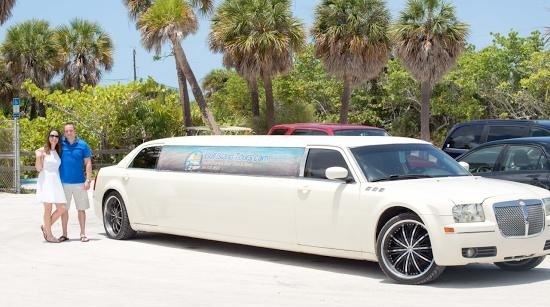 Limousine Service Englewood FL - FREE WITH YACHT CARTERS - Come inside our huge party bus or our super stretch limousine! Both come fully loaded wih DVD players, amazing sound systems, exciting stylish interiors and LED disco lights. 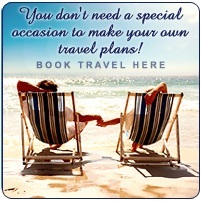 Perfect for Customized Beach Tours and Mega Shopping trips, Weddings, Proms, Anniversaries, Concerts, Football games and sporting events, Bachelor (ette) Parties, Night out on the Town, Casino Trips, Airport Transporation or any other special occasion. Ten person maximum. Our limo can be booked for any event in Southwest Florida. Since 2007, Gulf Island Tours, located just south of Sarasota Florida has been providing luxury Limousine transportation for corporate, family as well as individual travelers in Sarasota, Bradenton, Siesta Key, Longboat Key and surrounding areas. 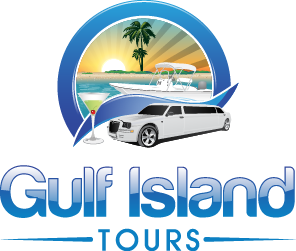 For transportation for a meeting or a special night out, you can rely on Gulf Island Tours to get you there on time every time. Our main focus is on total customer satisfaction! This makes Gulf Island Tours the limo service of choice for even the most demanding travelers. We will meet or beat any limo prices in Sarasota, Lee, and Charlotte counties for a comparable super stretch limousine or party bus. Many limos in our area have dated interiors so if you are paying the price for a luxury limo service, we definitely offer the best bang for your buck! Look out for competitors offering "much lower rates." This usually means the limo is old or that the drivers and vehicles are not properly licensed and insured. Both the Party Bus and the super stretch limousine meets and exceeds all state and federal requirements for safety. If you are vacationing in Southwest Florida, we can provide you with exciting "limo itineraries" you might not think of on your own! Here are just a few of many ideas. How about a Dinner and Sunset Themed Tour? If staying in Punta Gorda, Port Charlotte or North Port, here are some great limo tour ideas we can arrange for you. Start your special night out by having an early dinner at the Sandbar Tiki Bar in Englewood then arrive at the beach of your choice for a romantic walk on the beach as you watch the sun slip down into the sea. Manasota Key Beach, Blind Pass Beach or Englewood Beach are all great options for this. You can hang out at one or even see them all. For the more adventurous types, take your flashlights and head into the jungle along a half mile trail across from Blind Pass Beach! Another option is to ride south for brunch and then do the Sanibel Lighthouse Beach and Lighthouse Tour. This is a world renowned place for shelling and of course for viewing a dramatic Florida sunset. Very romantic limo tour and a great way to pop the question! Another fantastic and very romantic place to dine under the stars is on Gasparilla Island in the quaint town of Boca Grande. Or, if you want something a little more exciting, we can take you for a dining and bar hopping limo tour in downtown Fort Myers. There are plenty of trendy clubs, outdoor restaurants and really cool shops there for your enjoyment!